Happy Birthday, Frodo: 'Birth Day', a poem by jan-u-wine. 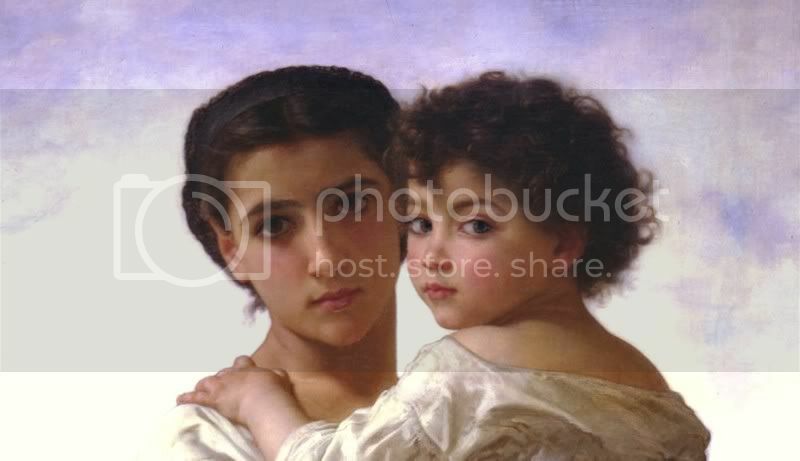 To illustrate this poem, I have used a detail from William-Adolphe Bouguereau's "The Young Gypsies" (painted 1879). I think it makes an evocative picture of Frodo and his mother, the young woman's face so lovely but melancholy, as if she already intuits what's ahead for her son, the child rosy-cheeked and cherubic, yet gazing directly at the viewer as if an older child were looking out of those eyes -- observant, self-possessed, wise beyond his years and, as yet, fearing nothing. I must cry with my love for you. and cradle you to my breast. the circle of my arms. ~ Second 2009 Birthday post: jan-u-wine's "Heir to the Dreamer" plus new Frodo manip. Mechtild's LJ entries featuring poems by jan-u-wine HERE. All of jan-u-wine's Middle-earth poetry, featured at LOTR Scrapbook, HERE. Lovely painting, and a wonderful poem. Hail to the birthday boy! Thanks for stopping by, Shirebound. Now I must go post the poem through Bilbo's eyes. It's one of my favourites. Yes, they are beautifully evoked. It makes my heart swell to read it. Thank *you*, Estë, for stopping in. I love to know our work brings you pleasure. That is a great baby Fro for all the reasons you say. I adore the beautiful picture that you've chosen to illustrate this. You've summed it up perfectly. "observant, self-possessed, wise beyond his years and, as yet, fearing nothing" .. and Jan-u-wine's poem is so touching. I'm afraid that i don't get nearly enough time to fully appreciate how wonderful her poems are, and how lovely are your posts. Ah I love Jan's poems! they are so rich and one is within two lines in another world or reality. Thank you so much for sharing this! They *do* lead the reader into their world, don't they? -- her poems, that is. Thanks for reading, Aredhelebenesse. Thank you, Mechtild and Jan-u-wine, for such a beautiful Baggins birthday gift. The picture is so perfect that it could easily be Primula and her son Frodo. And the poem is so sweet that it made me all emotional. Thank you and Jan-U-wine for this lovely post. The painting is gorgeous, the poem lovely. I echo Shirebound's comments and the quote from this lovely, loving poem. Love the whole thing but that quote the most. And Frodo as reader - isn't that to our beautiful, innocent lad! Love it! Quite captivating. This is one of the reasons I love him - because he is a scholar and scribe like me and this is lovely of him! Thank you so much. Thanks, AnneMarie, so much for stopping to comment. Jan-u-wine are always encouraged to hear from other fans who love Frodo Baggins. Jan has such a gift for getting inside her characters, entering into their points of view so that readers feel they come very near, whisper-breath close. Yet she remains respectful of their dignity and essential mystery.